Actually, the City knew all along where it was. It was destroyed when all of OB’s fire pits were moved to safer ground behind the berm late last year. OB had nine fire pits at the end of the summer and now we’re down to only eight. So, according to Park and Recreation Department Director Stacey LoMedico, OB will not receive another one. We’ve got all we’re gonna get. And we may lose them as well. Back in the late twentieth century, San Diego had 450 fire rings or pits – but by Fall of 2009, the City only had 186, scattered about the beach communities and around Mission Bay. Most remain in District 2, Councilmember Kevin Faulconer’s district – which includes OB, of course. All of the remaining fire pits are threatened with removal, according to the City, in order to save $121,000 spent annually to maintain all of them. The OB Rag, in response, embarked on a campaign to save OB’s rings, initiating an “Adopt-a-Fire-Pit Program”. Plenty of OBceans, individuals, an apartment complex, a few businesses, stepped forward and volunteered to adopt each of them. 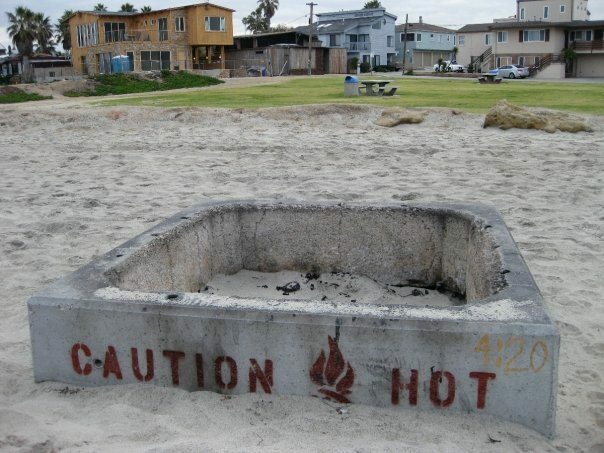 Meanwhile, the California Coastal Commission has stepped into the controversy and has announced that the City needs to obtain permits in order to remove the fire pits. The OB Adopt program is loosely tied into a coalition of local groups that are trying to keep the fire rings from being removed. Katheryn Rhoads, of that coalition, met recently with Deborah Lee, staff member to the local office of the Coastal Commission. According to Rhoads, Deborah Lee thinks the loss or closure of San Diego’s fire rings is a horrible idea. Lee supports volunteer efforts to keep them open. The City of San Diego still needs those permits, Lee says, and as of this date, has not filed the paperwork or application to get the issue before the Coastal Commission. It certainly is not on the March agenda. For Lee, it’s an issue of public access. The Commission’s goal is to increase public access to the coast and its amenities, like fire pits. The issue of the fire rings, as all other budgetary issues, goes before the full City Council in May. There’s funding to maintain the pits through June, but according to LoMedico, the City will begin removing them July 1st. The City’s attitude is that volunteer groups better get busy and raise the necessary funds. There’s a deadline of mid-April to get all the ducks lined up, as the Council goes into budget slashing mode in May. Thyme Curtis of Kevin Faulconer’s office is the point person on this issue. Although she is sympathetic to OB’s plight, she directs inquiries back to Stacey LoMedico, who is caught in her own bureaucratic redoubt and has her own marching orders. There is one report that states even Jay Goldsmith, the City Attorney, has stepped into this controversy, and was heard to say that LoMedico is incorrect, that the issue has to go directly to the Mayor, not to one of his departments. We’ll keep this issue alive and will offer periodic updates. This is government absurdity. $121,000 annually to pick up ash! Can I have this job? When are we as a society going to wake up from this bureaucratic, red-tape nonsense and just get things done to make positive change and chip in. People want to help, but our own government is roadblocking the people. Here’s an idea: don’t waste money on ridiculous tsunami evacuation signs. Don’t waste money removing benches from Sunset Cliffs Park, which people love. Stopping wasting money on deconstruction, tearing down and removal. Spend money on creation, building and progress. We are going backwards. Those firepits bring in tourists from the Midwest, South and Northeast who have watched movies their entire lives of the California beach culture, late night bonfires and the spirit of laughing, smiling and enjoying life in the company of friends and families along the most beautiful coast in the world. Why is maintenance cost in excess of 120k? I will gladly assume the title of Fire Pit Maintenance Custodian for 100k to save the city some money and keep the fires burning. You’re gonna get one of the forklift/Bobcat type things they use to completely lift the pit when cleaning it, get a truck and trailer to drag it around with, carry insurance on the vehicles and liability insurance on yourself, cover your gas and dump costs, pay your own benes, and hire a helper and pay that person’s benefits and insurance for $100K? Dude, put together a proposal and I bet you’re hired tomorrow! But with the money left over after doing all that, it’s probably a lot easier to get a higher-paying job making sandwiches at Subway. The mere possibility of removing these fire pits has gotten a write-up in the NY Times and a Facebook page with over 5,300 fans and counting. I’d stay away from this one if I were Faulconer. At least until his re-election is over. Just saying. Could be a HOT issue, so to speak. On the serious tip, if we lose the fire pits, some people will end up making illegal fires on the sand – and remnants of these fires will be stepped in unknowingly by other people, who really will get burned. Not cool. Let’s do what we can to SAVE THE FIRE PITS. Kudos to the OB Rag for contributing with the Adopt A Fire Pit program. I apologize – I failed to leave links to the various posts on the fire pit issue. Please, if you’re so inclined, go to our search bar and type in “fire pit”. So, in a sense, the missing fire pit’s existence has been proved by its non-existence.